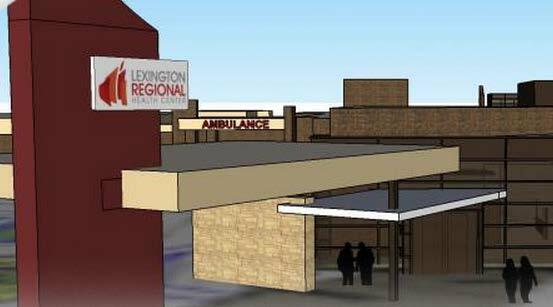 An artist’s rendering of the new emergency entrance to the Lexington Regional Health Center. Lexington Regional Health Center (“LRHC”) opened as Tri-County Hospital in September of 1976. The hospital began with seven patients, 40 beds, five physicians, one PA, a board-certified surgeon, and visiting specialists. The organization grew through the 1980’s and added additional services including radiology, therapy, rehabilitation, and hospice. A 4,300 square-foot expansion in 1989 relocated six physical therapy rooms, added a meeting room, and included an area for wellness programs for the community. The addition of Home Health Care services, which encompasses a 45-mile radius of Lexington, Nebraska, was completed in 1994. Another expansion in 1996 provided more room for the physical therapy department with the opening of the Community Health & Fitness Center. In 2005, Tri-County Hospital was designated as a Critical Access Facility by the State of Nebraska. Over the past 10 years, the Hospital’s inpatient and outpatient utilization has grown significantly. LRHC handles roughly one-third of all discharges in Dawson and Gosper counties, and more than half of the Hospital’s annual discharges are Medicare/Medicaid patients: LRHC has the 4th highest Disproportionate Patient Percentage out of all Nebraska hospitals. In response to the ever-increasing demand for its services, LRHC began laying out a comprehensive renovation and expansion plan in 2010. The two-phase construction plan includes the addition of a new operating room suite including 3 operating rooms, a new sterile processing department with supporting space, a new specialty clinic area, and a new central utility plant, as well as the renovation of 25 inpatient beds. On July 28, 2014, Crescent Growth Capital worked with LRHC, Enhanced Capital, and Wells Fargo to close and fund Phase 1 of the NMTC financing, a $10.4MM State NMTC QEI, leveraged with Great Western Bank debt and USDA Rural Development Loans, for the $25MM renovation/expansion. On November 20, 2014, Crescent Growth Capital and LRHC closed on Phase 2 of the expansion financing, utilizing $7MM of Federal NMTC allocation provided by Raza Development Fund. By using the same leverage sources and NMTC investor, the Hospital minimized the incremental transaction costs associated with the second closing, and used the additional subsidy to round out the construction budget. The two-phase NMTC financing provided significant subsidy to the project, facilitating the expansion of the Hospital’s footprint and scope of services — all at no additional cost to the low-income census tracts surrounding the Hospital. The expansion is expected to create 24 new permanent FTE positions, while retaining the Hospital’s existing 170 FTE employees.